Founder and Chairman of ANZCO Foods, Sir Graeme Harrison, is showing his unwavering commitment to New Zealand business by personally funding a Professorial Chair in Global Value Chains and Trade at Lincoln University. The newly created position will contribute to the research and teaching at the specialist land-based university – but it will also come with a far wider reaching remit: to help lead change in the way New Zealand businesses engage globally throughout the value chain. Described by Lincoln University Vice-Chancellor Dr Andrew West as “an extraordinarily visionary and generous act”, the funded professorial chair will need a unique set of skills. “As well as carrying core academic responsibilities, we see the appointee becoming a leading spokesperson on global trade, particularly around the challenges facing New Zealand’s agricultural exports,” says Dr West. . .
Federated Farmers is applauding the Ministry for Primary Industries prosecuting a Northland man for selling meat which had not been processed in accordance with the Animal Products Act 1999. The Chair of Federated Farmers Rural Butchers, Haydn Cleland says the successful prosecution shows the inspection regimes to protect the integrity of New Zealand’s food safety systems are working. . . Farmers are taking a cautious line on stock for processing during an increasingly dry summer, booking them for two to three weeks ahead. But they were ready to take them out if there was decent rain in the meantime, AFFCO Holdings interim general manager Rowan Ogg said. In some cases farmers might have lambs booked in with more than one processor, he said. AFFCO had more stock than it could handle. . .
(BusinessDesk) – New Zealand lamb wool prices rose to a three-year high last week on increased demand for the fibre from clothing manufacturers in China. The price for lamb wool jumped 10 cents to $6.10 per kilogram at last week’s North Island auction, matching a price last seen in January 2012, according to AgriHQ. The price for 35-micron clean wool, a benchmark for crossbred wool used for carpets and accounting for the majority of New Zealand’s production, was steady at $4.85/kg compared with the average price in auctions in both islands the previous week. Merino and mid-micron wool didn’t trade in the latest auction. 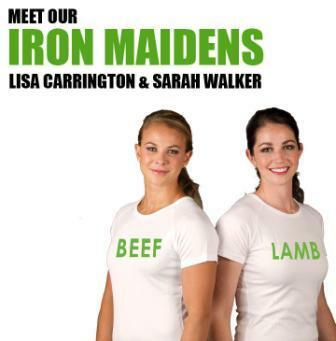 . .
Iron Maidens Lisa Carrington, Sophie Pascoe and Sarah Walker are set to judge the ninth annual 2015 Beef + Lamb New Zealand Golden Lamb Awards, aka the Glammies. The competition, supported by Zoetis, aims to find the most tender and tasty lamb in New Zealand, with categories for both farmers and retailers. With the sporting superstars on the panel, alongside foodwriter, Lauraine Jacobs and head judge Graham Hawkes, entries will have to be of superior quality to impress this year. Third time judge, Sarah Walker says she is thrilled to be involved in the competition once again. . .
With the acceptance of the NZ Forest Certification Association (NZFCA) as New Zealand’s PEFC Member, New Zealand forest growers gain visibility in the world’s leading forest certification system. “We are delighted to be accepted into membership of PEFC and to represent PEFC in New Zealand” says Dr Andrew McEwen, chair of NZFCA. With more than 260 million hectares of certified forests, PEFC (Programme for Endorsement of Forest Certification) is the world’s leading forest certification system, promoting Sustainable Forest Management through independent third party certification. PEFC works throughout the entire forest supply chain to promote good practice in the forest and to ensure that timber and non-timber forest products are produced with respect for the highest ecological, social and ethical standards. Thanks to its eco-label, customers and consumers are able to identify products from sustainably managed forests. . .
Iron deficiency remains an ongoing concern particularly for teenagers and women. 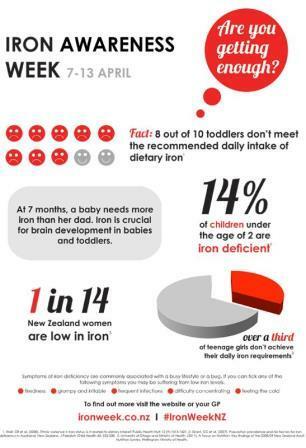 Dr Kathryn Beck of Massey University says “The latest National Nutrition Survey found over 10% of New Zealand teens (15-18 years) and women (31-50 years) had iron deficiency. Many more women are likely to have low iron stores and are at risk of developing iron deficiency”. Iron is found in a number of foods, with lean red meat providing one of the richest sources of easily absorbed haem iron; in general the redder the meat, the higher the iron content. There’s more information at Iron Week. Wanaka has had a very big weekend. The Motatapu Challenge, a rodeo and the Upper Clutha A & P Show attracted thousands. The show is the second biggest in the South Island, combining the best of traditional attractions with some newer attractions,one of the most popular of which is the Jack Russell race. For several years, the show has also hosted the Glammies – the Golden Lamb awards. 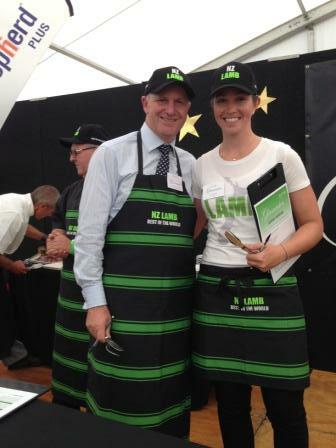 Prime Minister John Key and Beef + Lamb NZ Iron Maiden Sarah Walker. Waitaki MP Jacqui Dean always has a tent at the show – it was very busy and the mood was very positive. Representatives of at least one other political party generally turn up in election year but there was no sign of any others this weekend. Yet more proof their contention of caring about the regions is empty rhetoric. Beating out over 180 entrants, Mangapoike Ltd, represented by Pat Sheriff from Gisborne, has been crowned the 2013 Glammies Grand Champion. Their Composite lamb, processed at Silver Ferns Farm Takapau, took out the title at the final taste test, after being tasted next to 20 other finalists. The final was judged by Iron Maidens, Sarah Walker and Sophie Pascoe, food writer Lauraine Jacobs, Beef + Lamb ambassador chef Darren Wright and head judge and chef, Graham Hawkes. Hawkes noted the high level of quality this year, saying it was a step up from last year’s competition. . .
Grape growers say the hot, dry weather which is wreaking havoc for farmers could produce one of their highest quality yields in years. Gisborne grower John Clarke who is also New Zealand Winegrowers deputy chair said Gisborne’s growers have been enjoying the highly favourable conditions. Mr Clarke said the weather means there is no disease pressure and grapes which have been harvested in Gisborne in the last couple of weeks are displaying excellent flavours. He said the weather conditions around the country have been favourable for wine and growers have their fingers crossed the vintage this year will be fantastic. . . Imagine, shooting 40,000 elephants to prevent the land in Africa from going to desert because scientists thought the land couldn’t sustain them, only to find the effort was for naught and the idea as to why was totally wrong. That alone was a real eye opener. Every once in awhile, an idea comes along that makes you ask, “gee why hasn’t anybody seen this before?”. This one of those times. This video below is something I almost didn’t watch, because my concerns were triggered by a few key words in the beginning. … I want every one of you, no matter what side of the climate debate you live in, to watch this and experience that light bulb moment as I did. The key here is to understand that desertification is one of the real climate changes we are witnessing as opposed to some the predicted ones we often fight over. I like to add my recommendation that this is a Must See video, no matter what you think about Climate Change currently. . .
Several blogs are embedding a video featuring a 23 min lecture part, of an hour full length effort on combating desertification by Allan Savory who in the early years of his study advocated culling elephant herds to combat desertification on the vulnerable fringes of the deserts of Africa. He has now worked out what many graziers have known for years but has remained hidden due to an unpopular perception stance in great debates on denuding of soils contributing to degredation. Most farmers I have encountered in over 60 years of life are basically environmentalists if only because they understand a poorly maintained machine will eventually fail often with devastating outcomes. Yes there are some tossers in farming, there is at least one in every bus. . .
Winning the 2013 Bay of Plenty Sharemilker/Equity Farmer of the Year title has proved a natural progression for Russell and Nadine Meade. The couple won the2010 Bay of Plenty Farm Manager of the Year title and set about developing innovative and flexible investment opportunities to achieve farm business ownership. Now 50% sharemilking 220 cows for Barbara Sullivan at Whakatane, the couple took home cash and prizes in winning the top prize worth $16,600 at the awards dinner held at the Awakeri Events Centre last night. . . The latest organic market report launched on Wednesday (6th March) at Parliament confirms double digit growth of organics in New Zealand over the past 3 years and comes as great news for organic certifier BioGro, its certified producers and consumers. The organic sector has grown 25 per cent in the past three years – from $275 million in 2009 to $350 million in 2012. The export and domestic market for New Zealand organic products has grown on average 8 per cent a year at a time of global recession. BioGro’s CEO Dr Michelle Glogau says the report, funded by the organic sector umbrella group Organics Aotearoa New Zealand (OANZ) is a really positive sign of the increased demand for organics amongst consumers. ‘It supports the trends we are seeing with dramatic growth in certified wine and extension into health & body care products’. . .
It’s less than a month since the end of the Olympics but already most of us will have forgotten the names of the champions. It’s unlikely any but those keenly interested in sport ever knew the names of many if any of those who didn’t win a medal. Since then we’ve had the Paralympics, which got only a fraction of the media coverage given to the Olympics. New Zealand athletes won 17 medals but it’s unlikely most of us remember them, except perhaps swimmer Sophie Pascoe . She was recognised for winning three gold and three silver medals by being chosen as the flag bearer in the closing ceremony. Now the games are over who remembers the champions? Beef + Lamb NZ has recognised two with sponsorship. Olympic gold medallist Lisa Carrington and silver medallist Sarah Walker are the new faces of Beef + Lamb New Zealand. . .
B+LNZ Inc CEO Rod Slater says choosing the popular Olympians to front the organisation’s domestic marketing campaigns was a no-brainer. They follow in the footsteps of Sarah Ulmer, Georgina Earl (née Evers Swindell) and Caroline Meyer (née Evers Swindell), whom Beef + Lamb New Zealand continues to support.